King bed or two single beds, en-suite bathroom, balcony, TV with DStv. 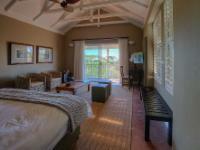 This spacious room offers views of the surrounding estate and includes tea/coffee facilities. Large suite with a king size bed, air conditioning, fully appointed en-suite bathroom, Wi-Fi and satellite television. If cancelling 7 days before arrival, forfeit 100% of the booking total. If cancelling 21 days before arrival, forfeit 50% of the deposit. If cancelling 30 days before arrival, forfeit 25% of the deposit.